Well one more week and we hit the road for the Kootenay Lake . We originally were going to look around for Turkey a little further South but now Plan "A" will be to try and catch some Gerrards and Dollies . If that does not go so well we will look for Turkey between Kaslo and Meadow Creek. Anyone have any experience Fishing the lake here and what to use for Tackle, also if anyone has a pointer where to look for Turkey in that area would be appreciated. Well it was a great adventure to a new Fishing spot. Lots of light rain and cloud and of Course sun on the last day..
First Fish to the boat was a Squawfish ?? or so i was told , i was not sure what it was at first. Some local talent must have painted this on the rocks..
We took a day out to go look for some Turkeys and then it was up to Gerrard at the North end of the Lardeau river where it joins Trout Lake.We found 4 Turkey hens in total at different spots. Its either the locals hate them or they love em and feed them..I know where to look now anyways. The pics are deceiving but my guess was the 800 and some pair of Gerrards were anywhere between 10 & 30 lbs. No wonder were not catching them in the lake they were up in the river..lol A young lady named Jess , spends 2 months doing the Count and she had all the info for our questions.. The sun came out the last 2 days but we managed to land a few as the water warmed up. Of course there is the one that got away, and it was stripping line faster than i could reel it in, lost it on the surface but it left that feeling of going back and trying to hook into another one of the Hawgs in the lake. Looks like a good trip bud! Maybe next year the stars will align and I can take you up on your offer and tag along. Maybe the Toms will show up then also! Great pics and thanks for sharing! Great Pics! And those are some great fish. Congrats. Well we did put a lot of time in on the Lake and i know where to find the Turkeys but it was tough to do both in a week. If we would have landed more fish sooner i would have switched over to turkey hunting for sure. Darcy if we get together next year for a turkey hunt its defintely best to leave the lure of the Boat behind. It is such a beautiful area on Kootenay Lake and that soak in Ainsworth Hot Springs is sure a great way to wind down for the end of the day. Ya Justin i really did not know what i landed with that Fish and i never found it in the BC regs. Honestly the trip to the spawning grounds of those is a must for any Fishing Nut. We even saw a few tagged fish in there. Springer looks like you had a GREAT time. Hellava nice trout you caught there! Next time you head there send me a PM I have fished about every inch of the lake and have a place up from balfour. There are turkeys behind my place on the power line that runs to Nelson. That squaw fish you cought is now called a pike minnow kill it throw it back in they are terrible fish. No Kidding Jimmy , we actually thought about heading down the Balfour way. I did post on the BC site asking questions on fishing the lake. It was a learning experience , especially with the downriggers. 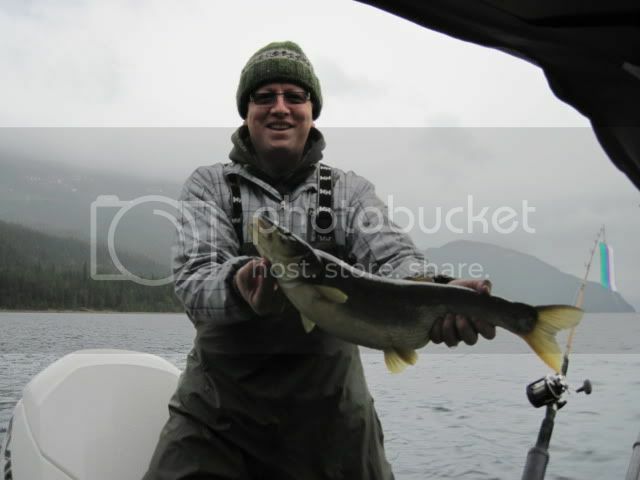 I did support Barons quite well in Kaslo with the tackle we purchased. I will pick your brain for next year definitely on both fishing and Turkey hunting , thanks for the offer. Really a Pike Minnow hey , I have caught smaller ones in other BC lakes and streams but nothing with a Gut on it like this one..